Beth’s birthday is always the week of Thanksgiving, usually before the holiday. She often says she likes this because it seems to usher in the holiday season. The timing has a potential downside, though, of swallowing or overshadowing her birthday. I was determined that wouldn’t happen this year. The kids and I did our birthday shopping early just in case my first plan didn’t work. We were in good shape, even with a few crazy days before Beth’s birthday, but then things got even crazier. To pick up where we left off, wasn’t I just telling you a story about how I was asked to bring June home from school early on a day when I had nothing urgent to do I and didn’t do it? Oh, the irony. Tuesday of last week I’d started work on a project that was much more difficult than I anticipated. By Thursday I was wondering how I was going to make the deadline, which was the day before Thanksgiving and co-incidentally Beth’s birthday. So of course in the wee hours of Friday morning, without any previous sign of illness, June woke up vomiting. Obviously, she’d need to stay home from school. I did squeeze in several hours of work in between snuggling with her in bed, reading book after book to her and playing game after game of Chutes and Ladders, but it set me back. I told Beth I’d need to work over the weekend. I had a very productive day on Saturday until I started to feel queasy at the computer in the late afternoon. I’ll spare you the details but I spent the rest of the day and most of the following morning in bed. Noah fell sick a few hours after I did and he actually seemed worse off. I could hear him moaning in his bunk off and on all night. He slept most of the next afternoon. By that time I was recovered and back to work, probably running on adrenaline since I’d slept so poorly the night before. I was really glad I’d taken the kids to get Beth’s gifts the previous weekend because there was no time this weekend when all three of us would have been up for an outing at the same time and I don’t know when we would have managed to shop for her. But luckily we’d already taken care of this errand. Beth had asked for some reusable cloth produce bags so I decided to buy two at the Co-op and let the kids fill them up with treats for her. I have to say it was possibly the most satisfying buying-gifts-for-other-people experience I’ve had with the kids. They accepted guidance readily but had enough of their own ideas that it didn’t feel like me making all the decisions and paying for it to boot and then saying, perversely, that the presents were from the kids, yet at the same time we didn’t buy anything completely random and inappropriate either. They each picked three items. Four out of the six contained chocolate (chocolate-covered pretzels, a dark chocolate bar, a black and white cookie and a box of chocolate toaster pastries). This is about the right ratio of chocolate to non-chocolate gifts to buy for Beth, I think. We also picked up a wedge of Brie and some rosemary crackers. I had renewed Beth’s subscription of Brain, Child (http://www.brainchildmag.com/) weeks earlier so her birthday gifts were in the bag, so to speak. Potential crisis averted. By Monday everyone was well enough for school and work and it seemed like we were back on track. Except Tuesday morning, Noah was feeling poorly again and he stayed home. I worked and read him a few chapters of The Emerald Atlas and then around noon, heeding a nagging inner voice, I made a phone call to June’s school. June had been complaining about her head itching since mid-October. Lice had occurred to me immediately and I knew Lesley does lice checks periodically at preschool so after school on the very first day June mentioned the itching, I took her over to the Purple School for a visit and an impromptu lice check. Lesley didn’t see anything. I checked it off my mental list of possibilities and then for weeks we wondered why June’s head was itching/ We stopped using her detangling spray and considered trying all new hair care products. Finally, I started to think we should get her checked again, just in case. You know where this is going, right? I must have taken June to Lesley before the lice really got settled in her hair because the nurse pulled June out of class to check her and called me back at 12:45 with the news that she did indeed have lice and I needed to come get her immediately. So, I brought her home and that was the end of the school week for both kids. Later that afternoon, we had 504 meeting for Noah with the disappointing outcome that he did not qualify for any accommodations under his ADHD-NOS diagnosis but that might under his dysgrahpia diagnosis, but that will require input from an occupational therapist and possibly yet another meeting (our third this fall) to determine. I think we might have been more upset by this if not for the lice. The rest of the afternoon and evening was a blur of activity. There was bedding to wash in hot water and dry at the highest setting, brushes and combs to soak in rubbing alcohol, and hair to rub with smelly lice-killing shampoo and then comb out with the nit pick. We spent hours on the kids’ hair but sometime during Noah’s, which surprisingly turned out to be much worse than June’s, we started to think we might need the services of a professional. I found a few companies online, made some calls, conferred with Beth and made an appointment. So the next morning the kids stayed home from school and Beth stayed home from work and at nine a.m., a professional nit-picker walked in our door. Beth said making sure we were all properly deloused was her birthday present to herself. 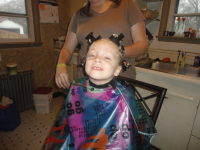 We all had our hair combed and picked (and we all did have lice, in varying degrees). It took about three hours for her to do all four of us. She said Noah was in the worst shape and had probably had them longest. Since he never itched (no-one did except June) who knows how many months he was walking around with lice? I don’t like to think about it. I did four more loads of hot water laundry, and made Beth’s birthday cake (with some help from June) and some brandied sweet potatoes to take to YaYa’s for Thanksgiving. Beth made vegetarian stuffing and gravy. All day we ate well. Beth shared her chocolate toaster pastries at breakfast and her Brie and crackers at lunch. In the afternoon she ran some errands and got herself a free birthday cupcake at Cake Love (to save for later). For diner we got Burmese takeout and then ate cake and ice cream. The can of pink frosting I was using for accents turned out to be almost empty and created more of a graffiti paint splatter effect than the roses June and I were originally going for, but I liked it. It was that kind of birthday, not what we expected, but with its own sweetness. We did get an extra day all together before the holiday weekend, so I hope it was lousy only in the most literal sense of the word. 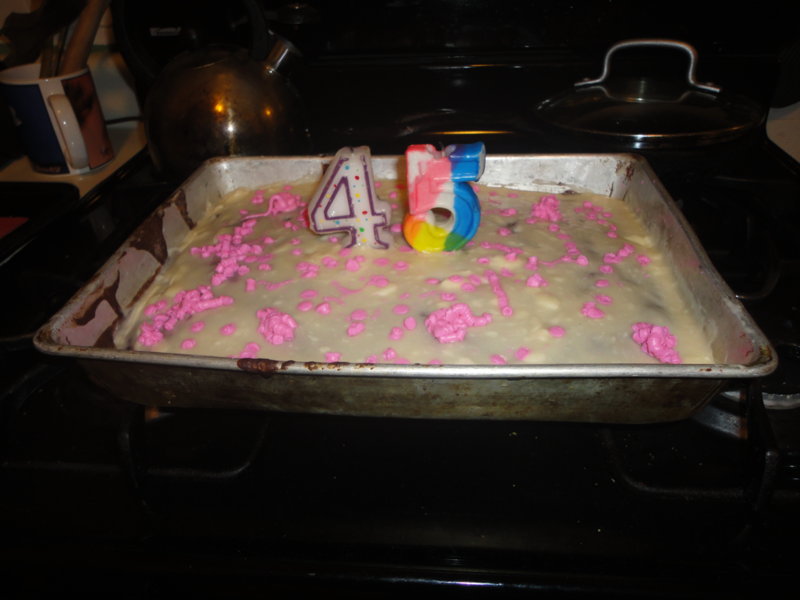 This entry was posted in ADHD/Dysgraphia, Anniversaries, Birthdays and Half-Birthdays, Medical Issues by Steph. Bookmark the permalink.